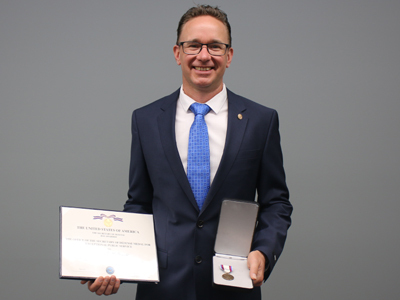 DST's Marcus McDonald has been awarded the highest award of the United States Office of the Secretary of Defense to a non-US civilian officer: the Medal for Exceptional Public Service. Marcus was presented with the award from AVM Leigh Gordon in a small ceremony at DST Melbourne last week. The award recognises his outstanding contribution to the F-35 program during his three-year stint with the JSF Program Office in the US.